Research is vital and at DMU students are vital to research. Contributions from students are vital in helping move campus research forward. The Mentored Student Research Program is an excellent opportunity for students to highlight their research findings. We’re excited to offer both oral and poster presentations and all summer research students are invited to participate. Students may present on any topic or experience related to research. You must login or create an account before enrolling in this educational activity. Once you're logged in, click the green "ENTER" button found in the Course Summary box to the right. Your registration will then be confirmed. Download the print shop order form. The agenda will be updated as additional details become available. Type the title first, using title casing. Capitalize the first letter of each word except prepositions, articles and species names. Italicize scientific names of organisms. List all authors, institutional affiliations and short addresses (city and state only). Bold the names of the author(s) presenting the work. Does the abstract clearly state the aim of the project (i.e. a research question, theoretical issue, or problem)? Is the significance of work clearly stated? If relevant, are the methods, data collection, and analysis procedures well-designed and appropriate to the question addressed? Are the conclusions justified in relation to the data and/or analysis/description? Is the abstract written clearly and organized well? Students will have the opportunity to discuss their research through oral or poster presentations. Most students do not complete an entire research project during the summer, but rather work on a portion of a larger study. When thinking about doing an oral or poster presentation, it is perfectly acceptable to focus the student’s presentation on hypotheses and methodology in the absence of conclusive results. It is ideal if you begin discussing with your student early in the summer about what they can present. Students may apply to be selected to be included in the student keynote portion of the closing program. Four students will be chosen to give an oral presentation involving 12 minutes to speak and 3 minutes for audience questions about the research they conducted throughout the summer. If the work is co-authored, only the PRESENTING author will submit on behalf of all co-authors. The names of all co-authors must be listed in the submission form. For work with multiple authors, the authors can decide among themselves their various roles in presenting within the 12 minute limit. A moderator keeps track of your presentation time and may also facilitate the discussion. Microsoft PowerPoint 2010 will be used to project slides. Please make sure your presentation is compatible with this program. If you prefer to use a MAC computer you will be responsible for bringing an adaptor. Presentation and video files should be stored on USB drives. Students who are not doing an oral presentation must present a poster to showcase their work over the summer. The posters will be displayed during the closing program. If the work is co-authored, only the PRESENTING author will submit on behalf of all co-authors. The names of all co-authors must be listed in the submission form. Materials to hang your poster will be available onsite. Posters are displayed throughout the day. Please do not remove your poster until the end of the day’s activities. Students with an odd numbered poster will present from 10:15 - 10:45 am. Students with an even numbered poster will present from 11:30 am - 12 pm. Posters must be hung by 8 am and removed by 1:30 pm. If you’re able, please hang your poster as early as possible as we encourage people to view them the entire day. Prepare and practice a short summary speech—no more than 3 minutes—about your project. This is an excellent networking opportunity, so it is important to speak and interact professionally. Any remaining posters will be kept in the CME office (AC #430) until July 31, 2019. Optional: Click here to choose from six DMU approved research templates. Posters for the program must be printed at the DMU print shop and emailed to printshop@dmu.edu. Posters will need to be submitted to the print shop and proofs signed by Tuesday, July 19 by 3 pm. The poster will not be reviewed for academic content. The print shop is located on the second floor of the DMU clinic. For poster printing questions, please contact the DMU print shop at 515-271-1402. If your project involves human or animal research, you must have obtained IRB or IACUC approval, unless you are clearly presenting your work as a proposed project and make it clear that absolutely no research has yet been conducted. Posters involving such research should indicate an approval number or state that no research has been conducted. Anyone giving an oral presentation on a project involving human or animal research must have an IRB or IACUC approval. For questions, please contact the DMU Office of Research at 515-271-1445. Have questions regarding the Mentored Student Research Program? If your question isn’t answered, please contact DMU CME at cme@dmu.edu or 515-271-1596. Des Moines University is located on a 22-acre campus in the heart of Des Moines, Iowa. Just west of downtown on Grand Avenue, the University is located in one of Des Moines' most prestigious neighborhoods. The campus is in a historic neighborhood filled with tree-lined streets and gracious older homes and businesses. Its central location makes it easy to access the rest of the city and outlying communities. 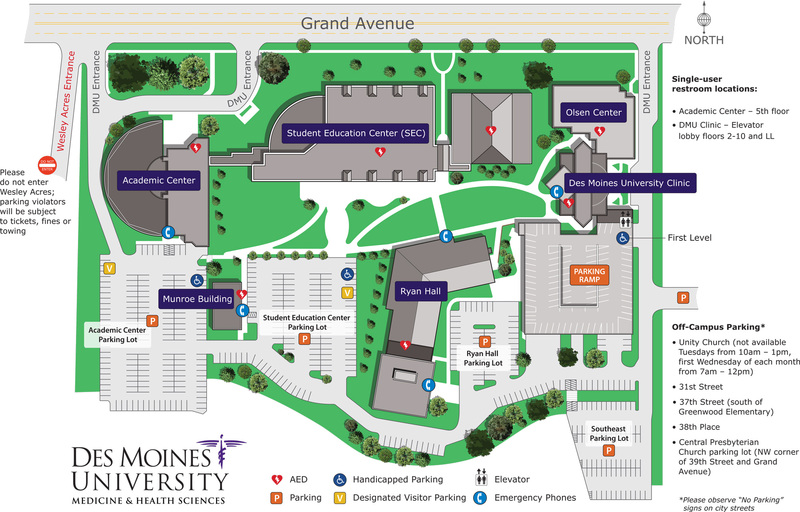 The campus is close to the Des Moines International Airport, located on the bus line and just blocks from local shopping and downtown Des Moines. DO: Des Moines University (DMU) is accredited by the American Osteopathic Association (AOA) to provide osteopathic continuing medical education for physicians. DMU designates this program for a maximum of 3.0 AOA Category 1-A credits and will report CME and specialty credits commensurate with the extent of the physician’s participation in this activity. DPM: Des Moines University (DMU) is approved by the Council on Podiatric Medical Education as a provider of continuing education in podiatric medicine. DMU has approved this live activity for a maximum of 3.0 continuing education contact hour(s). MD: This activity has been planned and implemented in accordance with the accreditation requirements and policies of the Iowa Medical Society (IMS). Des Moines University (DMU) is accredited by the IMS to provide continuing medical education for physicians. DMU designates this live activity for 3.0 AMA PRA Category 1 Credit(s)™. Physicians should claim only the credit commensurate with the extent of their participation in the activity. ​Other health professionals: This live activity is designated for 3.0 AMA PRA Category 1 Credit(s)™.